This is 6 ft. long, stereo A/V output cable for Sony VAIO laptop computers. 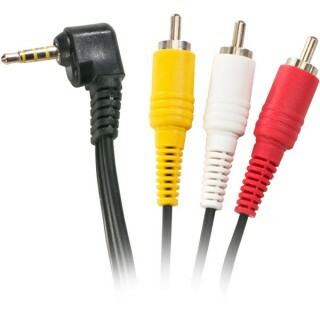 One end of the cable has a 3.5mm mini plug and the other end has three color coded RCA plugs (video and stereo audio). The cable plugs into the "A/V OUT" jack on many recent Sony VAIO laptop computers, and will allow you to connect it to the RCA input jacks on your TV or VCR for video and stereo audio output. You may need to toggle the video output from the screen to the A/V OUT jack, which is usually done by pressing Fn + F8. Please note that this cable does not work with all Sony VAIO laptops. Some models output video only, and require an additional cable for audio. You will need to check your user manual to see if this cable is compatible with your laptop.